Shri.K.Govindaraju, Director of SEVAI honoured Shri R.K. Kulshrestha ,General Manager of Southern Railway by handing over a tree sapling on behalf of Railway Children on 24th October 2018 at SULAYALAL Hall, Southern Railway Head Quarters in Chennai on the occasion of felicitation of Railway officials of Southern Railway for their outstanding contributions for protection of children at Railway Stations of Southern Railway. Shri.D. Om Prakash Narayan, Sr.PRO of Southern Railway reports, “1020 children rescued this year by RPF efforts: southern Railway & NGO jointly felicitate staff for outstanding contribution for protection of children at Railway Stations.15 RPF Personnel and 22 Commercial Staff were felicitated jointly by Southern Railway and “RAILWAY CHILDREN”- an NGO working for street children. Shri.R.K. Kulshrestha, General Manager, Southern Railway felicitated the 15 RPF Personnel and the 22 Railway Commercial Staff in the presence of Shri P.K.Mishra, Addl General Manager, Shri Birendra Kumar, Principal Chief Security Commissioner, RPF, Shri Sanjay Tiwari, Strategic Alliance Manager, Railway Children NGO and other invitees. Those who were awarded with medals and certificates by the General Manager were those who have personally taken initiatives and involved themselves in rendering outstanding contribution for protection of children at railway stations. The function was organised jointly by Railway Children India (RCI) and Railway Protection Force at Southern Railway headquarters today, the 24th of October, 2018. Railway Children India’ (RCI) is an NGO that works in association with Government of India and Indian Railway authorities across various zones and divisions of Indian Railways. The NGO is actively involved in bringing sustainable changes in the lives of children at risk at Railway stations and o­n the streets. 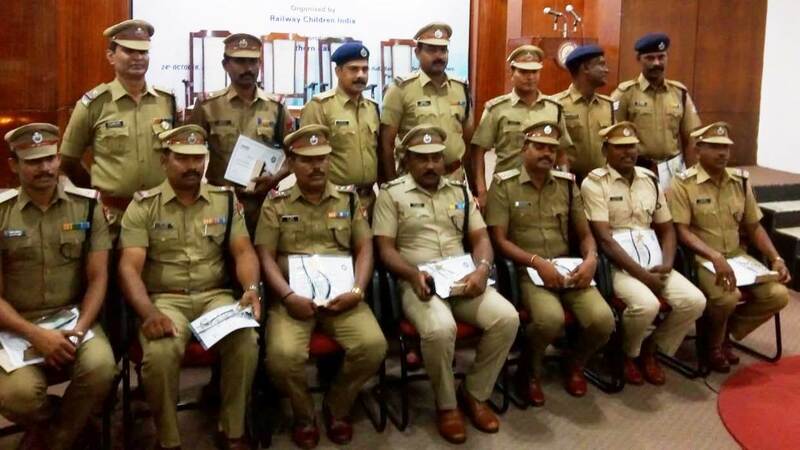 RCI has been conducting capacity building programmes at RPF academy and Zonal Railway Training Institutes including the Multi-Disciplinary Zonal Railway Training Institute at Tiruchchirappalli. 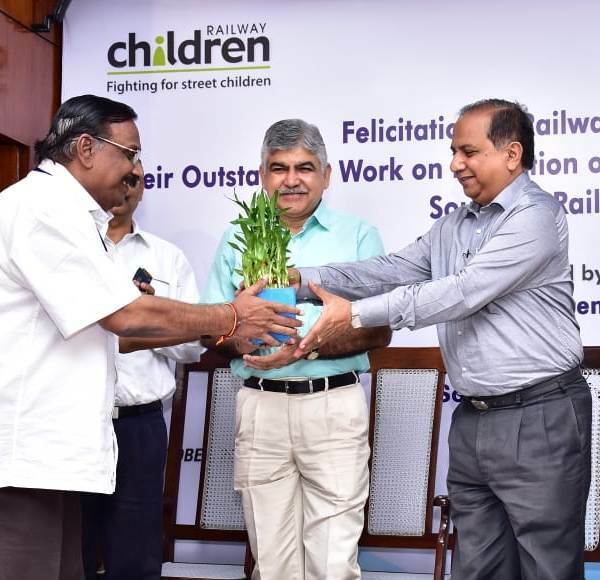 Presently, RCI has been implementing an outreach programme o­n child protection at 4 Railway stations of Southern Railway viz., Tiruchirappalli, Salem, Katpadi and Villupuram. 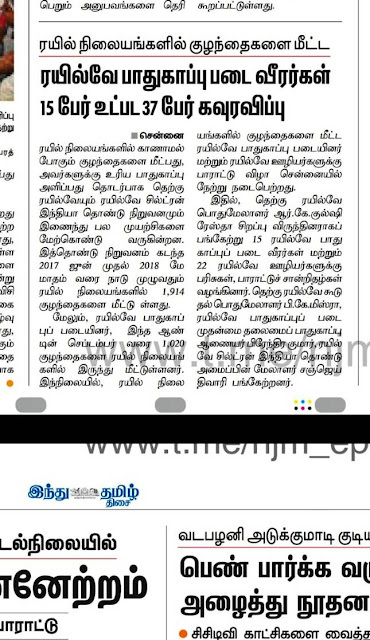 Through the programme, Southern Railway in coordination with RCI identified, rescued and rehabilitated a total of 1914 children who were in need of care and protection from June 2017 till May 2018. As a result of tireless, vigilant and prompt action with compassion and Humane touch, RPF has been decorated with the “Service of Excellence Award” by the Ministry of Home Affairs for the efforts in rescue of missing children under Operation MUSKAN drive in 2017.The Railway Protection Force rescue many children daily from trains and Railway premises and hand them over to the safe and secure hands of their parents, relatives, NGOs, Child Welfare Committees or other Legal Rehabilitation Institutions established by Law, thereby bringing a smile o­n the faces of thousands of aggrieved parents/relatives of missing children every year.A Guidebook for creating a child friendly and protective environment for children in contact with Railways has been prepared by RCI in association with National Commission for Protection of Child Rights and is distributed for the guidance of Railway personnel”. Shri.Sanjay Kumar Tiwary, Manager Strategic Alliance, Railway Children gave welcome address.Mr.Valavan, Programme Manager, Railway Children India presented an overview of RCI’s interventions in India and South.Mr.Johnbosk,Sr. Strategic Alliance officer, Railway Children proposed vote of thanks.RCI-NGOs senior management teams of Tiruchchirappalli, Salem, Katpadi and Villupuram were present in this function.-Kris.